A recent report conducted by the Ellen MacArthur Foundation, a charity working to accelerate the circular economy, stated that the textile industry produces more than 1.2 billion tonnes of greenhouse gases annually, more than that produced by international flights and commercial shipping combined. In Australia alone, more than 500,000 tonnes of textiles are sent to landfill every year. Not only are the methods of fashion production and disposal contributing to the pollution of the atmosphere, but the people who make the garments are frequently working under deplorable circumstances. Many of the conditions through which the fashion industry functions are far from ethical, let alone sustainable. In opposition to such industry practices, ethical fashion brands have begun to emerge, gaining significant traction in the last five years. In 2012, Bruno Pieters developed the Antwerp-based brand Honest by., “the world’s first 100 percent transparent company”. Since then, numerous companies, such as Ethical Clothing Australia (ECA), an ethical accreditation platform established in 2013, and Well Made Clothes, an online ‘marketplace’ for ethical fashion launched in 2016, have been moving towards greater transparency and sustainability in their business models. This shift in industry practices has seen terms such as ‘ethical fashion’, ‘conscious design’, ‘sustainable practice’ and ‘brand transparency’ become more familiar, but their exact meaning is still murky. To better understand this terminology, I got in touch with designers who are committed to ensuring the ethical nature of their companies and who encourage the move towards more sustainable, transparent practices across the fashion industry. In May 2017, Jade Sarita Arnott relaunched her Melbourne and New York-based brand Arnsdorf following a five-year hiatus. With the relaunch, Arnsdorf has evolved from the traditional, seasonal brand it was from 2006–12, to an entirely ethical company, sourcing sustainable materials and manufacturing every garment in-house. When I asked Arnott about the decision to relaunch Arnsdorf as an ethical company, she remarked that she was no longer “interested in following the traditional models of the industry”. Instead, she was interested in “creating a new vision for a modern womenswear”, a vision based on the values of design, sustainability and ethical production. Rather than producing a full collection for wholesale, Arnsdorf now release small-scale collections, sold directly via their website or the newly opened Melbourne store. Arnott notes that while this process “has increased the time and cost of the cutting”, it’s fundamental to sustainable production as it “has allowed us to eliminate over-stocking and the residual waste of materials and resources that follow. In addition, eliminating the wholesale to retail margin has allowed us to invest more resources into producing a very sustainable product under ethical conditions at an accessible price point for our customers.” The emphasis on transparency and ethical production is a radical step away from traditional fashion design models, and Arnott is not alone in her belief that this system is the way of the future for fashion. New Zealand brand Kowtow, founded by Gosia Piatek in 2007, follows similar ethical principles. Like Arnott, Piatek is dedicated to producing clothes with a minimal environmental impact. Having spent over 10 years in the industry, Kowtow is now certified in many of its ethical practices. 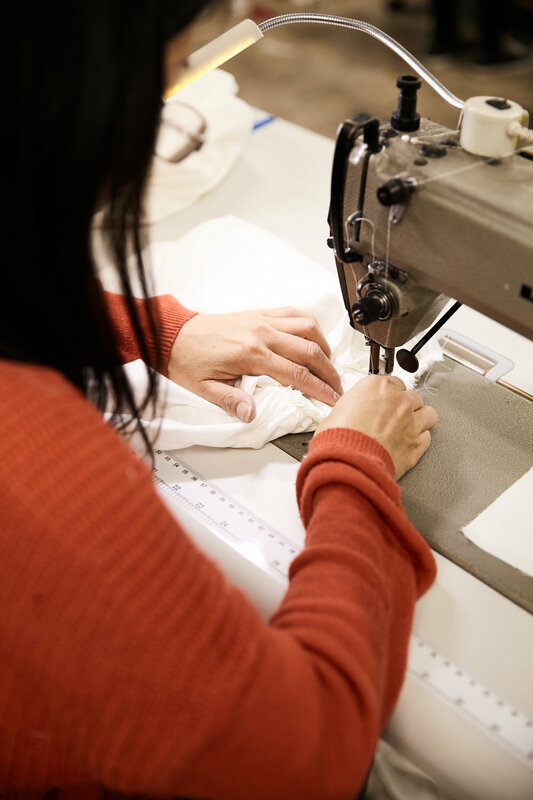 It ensures a level of certainty about the ethics of Kowtow’s working practices and allows more people to be engaged in the processes of ethical clothing production – yet she is careful not to allow such accreditation to generate complacency. Piatek is always looking for new ways to work by more ethical or sustainable means. “We instil that sort of mindset in people from the get-go; we are always asking questions.” This solutions-based approach is far more exciting to Piatek, who says, “My mind is always thinking about the solutions, not about the problems; if there’s a problem, we want to solve it.” Not only does this approach apply to design, it includes the whole process “from the seed to the garment”, including yarn manufacturing, dye sourcing and packaging for dispatch. It even extends to responsibility for the garment beyond the purchase to the life cycle of the item. In the years since the label was first established, Piatek has seen real change in the industry. Questions of ethics and sustainability have become increasingly important for both producers and consumers, and ethical fashion itself has transformed from being the marginal, fringe trend it once was to a luxury good, an aspirational style, both popular and desirable. As consumers becoming more aware of the issues at stake in the fashion industry, the demand for ethical, sustainable fashion is growing. Arnott says, “People are much more discerning about their purchases; they expect quality and traceability.” But consumers of fashion are not interested in substance without style. Consumers still want fashion that looks good. For Arnsdorf, Arnott notes, “There are people who are attracted to the brand for the design and sculptural aesthetic and others that have come to it for the values of sustainability, transparency, ethical and local production that it represents and for many it is a combination of the two.” Piatek recognises similar characteristics in her customers, women who are interested in the ethics, but are also drawn to her minimalist design aesthetic. “We design the pieces because we love them and we want to wear them. And then we have this secondary part to the business, which is its sustainability and ethics foundation.” The tiers of design, ethics and sustainability function simultaneously. The layers are intertwined, tightly woven. Throughout my conversations, it became clear that ethical fashion is a layered concept. The critical issues at stake bridge design, environmental and social dimensions. Design issues relate to the question of fashionability, the classic concern with producing desirable items. Environmental ethics relate to issues of resource (chemical, water, energy, material) use and disposal, and include questions of over-production and waste. Social ethics relate to policies and practices surrounding labour, including worker safety and supplier relationships. These elements are interconnected; ethical fashion is not merely ethical, it is also fashionable. The aesthetics of these brands are just as important as their values. Harriette Richards is an academic working in the fields of fashion theory and cultural studies. She completed her PhD at the Institute for Culture and Society at Western Sydney University and is now based in Melbourne.